The key elements of organisational planning for language services. Use of multilingual or bilingual staff solely to provide limited interpreting. Sometimes more than one approach is needed to ensure that language services meet client needs. A language service response should include the following elements. The Victorian Government requires agencies providing direct care services to have clear policies for delivering language services. These policies should comply with Victorian Government policy and standards, cover relevant legal issues, specify when accredited interpreters and translators need to be used, and address the needs of current and potential clients. In your procedures, include a requirement to use stickers marked ‘interpreter required’ on client files to alert staff that an interpreter needs to be booked in advance. Make sure that you set a budget and allocate funding to language services in the planning phase of a service or project. The allocation of funding should reflect the anticipated need for these services and be monitored to respond to changing circumstances or demographics. Allocate responsibility to a staff member for coordinating and monitoring language services, including a budget allocation. Staff require a level of knowledge and skill to use language services effectively. Training can be provided in-house or by an external trainer and should be offered at employee induction and on a regular basis to ensure skill maintenance. Provide relevant training tailored to the diverse needs of staff on an annual basis. It is important to monitor and evaluate the quality, use and effectiveness of language services. Report the results across your organisation to provide feedback to staff. Data can also be used to monitor processes and measure improvements. A central language services booking system will enable your organisation to monitor use, trends and unmet needs, and ensure that resources are used efficiently. Promote the availability of interpreters as widely as you can. Place signage, such as the National Interpreter Symbol, posters and brochures (including interpreter cards) in foyers and reception areas. You should also take an active approach by distributing interpreter cards and informing clients of the availability of interpreting services rather than waiting for them to ask. Promote the availability of interpreters during information sessions to community groups. 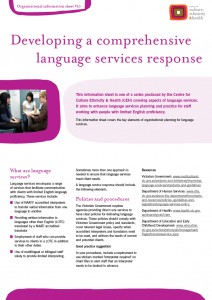 The Centre for Culture Ethnicity & Health (CEH) offers training in using language services, as do most interpreting and translation service providers. The Victorian Government has information kits and resources promoting the availability of professional interpreters. These include posters, stickers and interpreter cards. Most interpreting agencies provide posters that promote the availability of interpreters. The National Accreditation Authority for Translators and Interpreters (NAATI) is the national standards body for interpreting and translating in Australia.